I. Why Should a Printer Drown in Paper? Published for the class of DIGIT 100 at Penn State Behrend for the final project. Documents scanned and borrowed from the Kochel Library for use of coding. Penn State Behrend Kochel Library Archives. All word converted to full and complete sentences using google drive. The documents were archived badly, lots of damage and water marks. Document annoted by hand in some parts, unkown author, advertisement editor. 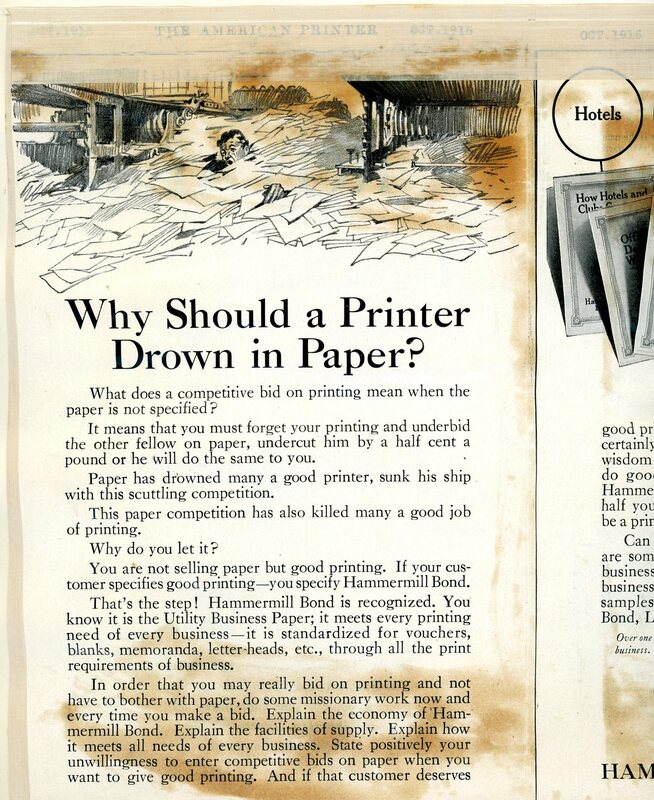 OCT. 1916 Why Should a Printer Drown in Paper? What does a competitive bid on printing mean when the paper is not specified? It means that you must forget your printing and underbid good pr the other fellow on paper, undercut him by a half cent a certainly pound or he will do the same to you. Paper has drowned many a good printer, sunk his ship with this scuttling competition. This paper competition has also killed many a good job of printing. Why do you let it? You are not selling paper but good printing. 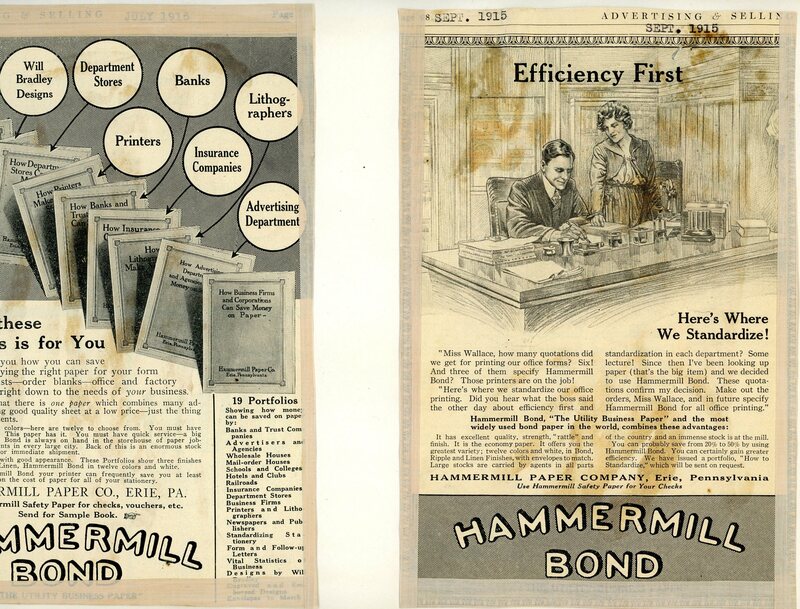 If your customer specifies good printing-you specify Hammermill Bond. That's the step! Hammermill Bond is recognized. You samples know it is the Utility Business Paper; it meets every printing need of every business--it is standardized for vouchers, blanks, memoranda, letter-heads, etc., through all the print requirements of business. In order that you may really bid on printing and not have to bother with paper, do some missionary work now and every time you make a bid. Explain the economy of Hammermill Bond. Explain the facilities of supply. Explain how it meets all needs of every business. State positively your unwillingness to enter competitive bids on paper when you want to give good printing. And if that customer deserves good printing he certainly will see the wisdom of letting a printer do good printing. Once Hammermill Bond is specified half your troubles are done-- you can then be a printer--a specialist in your chosen field. Can we help you? We can and will. There are some thirty portfolios each dealing with some special business need and solving it by paper--and print. Every business is covered by some one portfolio. Each contains samples of Hammermill Bond in 12 colors, all weights-- Bond, Linen and Ripple finish. Over one thousand printers have a complete set of these portfolios and are using them to get business. Do you want a set for the same purpose? Write us on your business letter-head. Miss Wallace, how many quotations we get for our printing forms? Six! And three of them specify Hammermill Bond? Those printers are on the job! It has excellent quality, strength, rattle and finish. It is the economy paper. It offers you the greatest variety; twelve colors and white, in Bond, Ripple and Linen Finishes, with envelopes to match. Large stocks are carried by agents in all parts of the country and an immense stock is at the mill. You can probably save from 20% to 50% by using Hammermill Bond. You can certainly gain a greater efficiency. We have issued a portfolio, How to Standardize , which will be sent on request. I’ve bought a good many tons of paper, but I haven’t discovered any super way to get uniform quality--at an economical price--than to stick to the paper which bears this Hammermill water mark. The maker has more at stake than I have, for if the paper turns out badly he has damaged the prestige of his priceless trade mark. 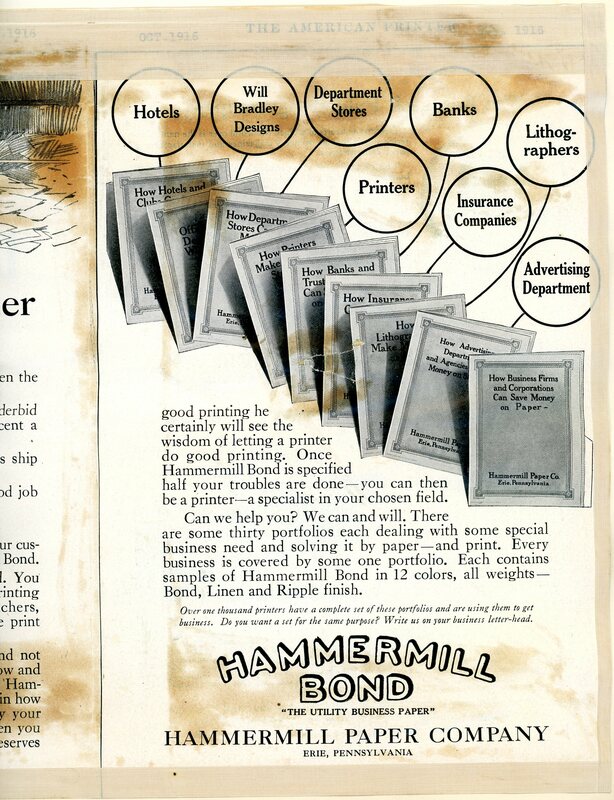 It’s a safe bet, that the watermark, ‘Hammermill Bond’, will never go on paper that isn’t right. Hammermill Bond is a paper of excellent quality. It is sold at so reasonable a price that a great many large concerns use it exclusively for office forms, stationery, price lists, bill heads, etc. It frequently offers a saving of 25% to 50%. Perhaps the greatest single advantage of specifying Hammermill Bond is that your printer can get any quantity without delay. Our agents in important cities carry large stocks at all times and the enormous reserve stock at the mill includes all weights, twelve colors and white, and three finishes--Bond, Ripple, and Linen. FREE We issue a Portfolio for almost every kind of business. They are full of detailed information of value to buyers of printing-sample forms and various designs which are adaptable to your needs. One of these Portfolios is for you. Write for it on your business letterhead. Use Hammermill Safety Paper for checks, vouchers, etc. The Boss has asked for it a dozen times--some big deal is on-I’ll take it in to him. This particular firm has allotted to each branch office a special color of paper for forms, order blanks, records, etc. It saves an astonishing amount of time, insures more accurate filing and tends toward efficiency in many ways. A printer gave them the idea and we gave it to the printer by means of a portfolio, The Signal System. 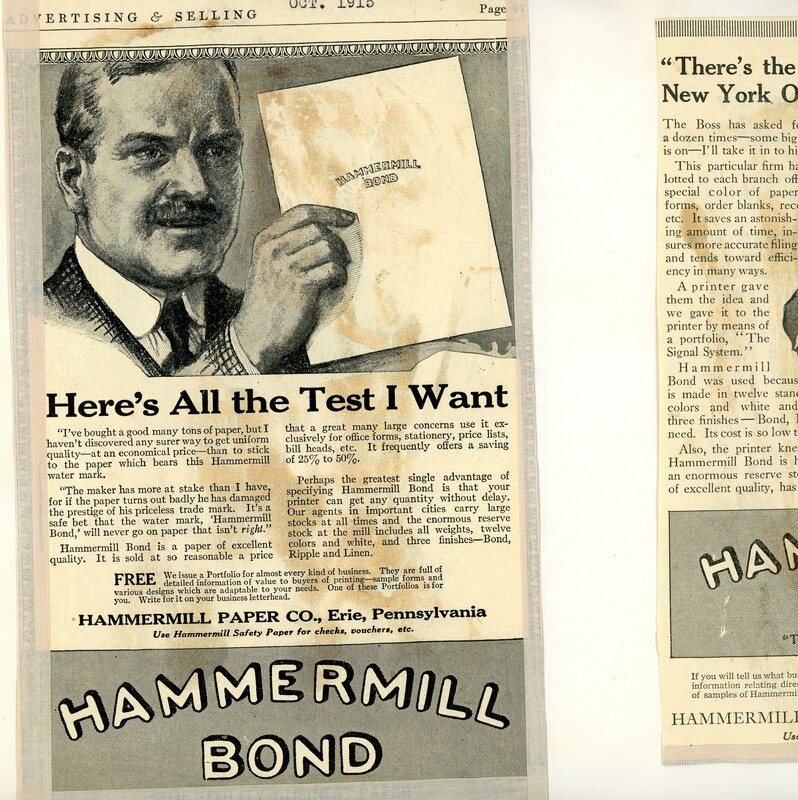 Hammermill Bond was used because it is made in twelve standard colors and white and in three finishes -- Bond, Ripple, Linen -- thus giving an assortment covering every need. Its cost is so low that it can be used with economy for all business purposes. 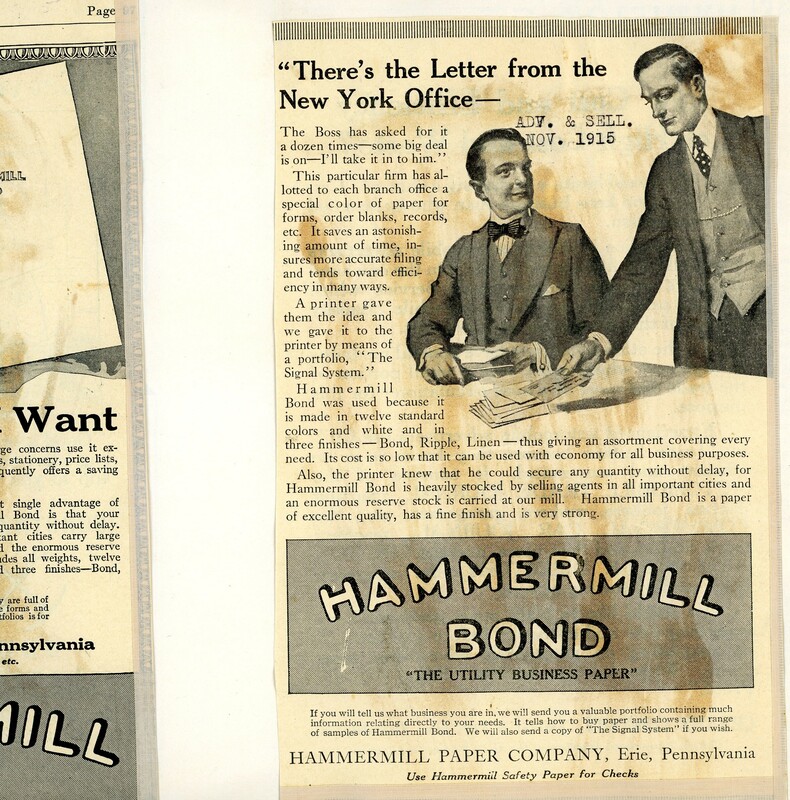 Also, the printer knew that he could secure any quantity without delay, for Hammermill Bond is heavily stocked by selling agents in all important cities and of an enormous reserve stock is carried at our mill. Hammermill Bond is a paper Bond is that your of excellent quality, has a fine finish and is very strong. If you will tell us what business you are in, we will send you a valuable portfolio containing much information relating directly to your needs. 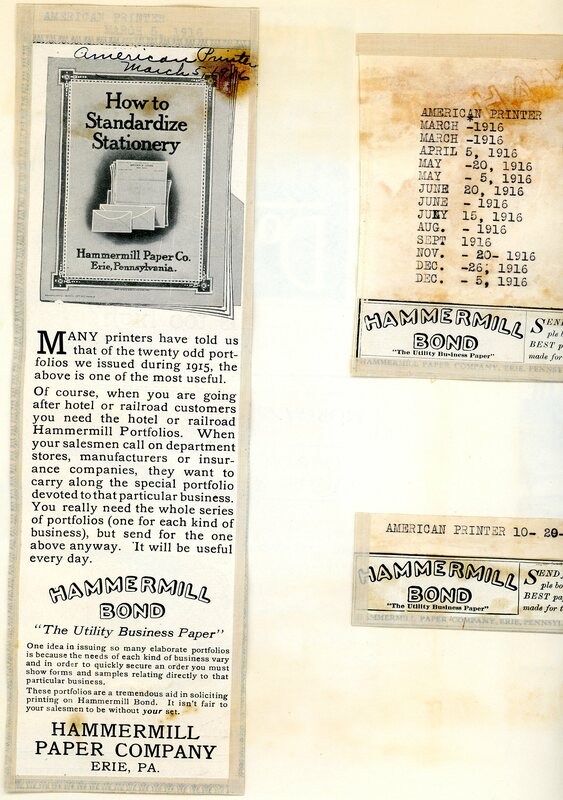 It tells how to buy paper and shows a full range of samples of Hammermill Bond. We will also send a copy of The Signal System if you wish. MANY printers have told us that of the twenty odd portfolios we issued during 1915, the above is one of the most useful. Of course, when you are going after hotel or railroad customers you need the hotel or railroad Hammermill Portfolios. When your salesmen call on department stores, manufacturers or insurance companies, they want to carry along the special portfolio devoted to that particular business. 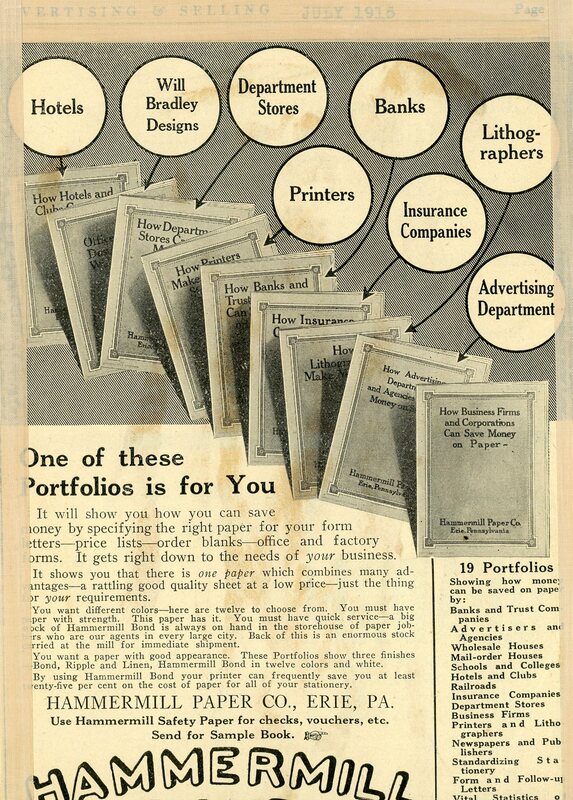 You really need the whole series of portfolios (one for each kind of business), but send for the one above anyway. It will be useful every day. One idea in issuing so many elaborate portfolios is because the needs of each kind of business vary and in order to quickly secure an order you must show forms and samples relating directly to that particular business. These portfolios are a tremendous aid in soliciting printing on Hammermill Bond. It isn't fair to your salesmen to be without your set. HAMMERMILL PAPER COMPANY ERIE, PA.